I see a lot of injured runners. Some of them are re-injured, or newly injured, or chronically injured and there are a few who aren’t really injured but they think they are. 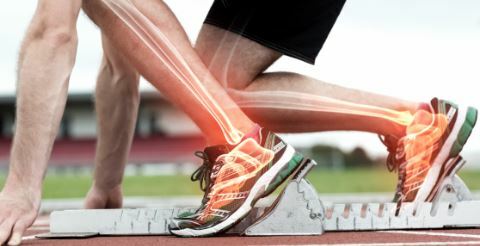 It would be easy to conclude that running isn’t good for you… because of all the injuries. In fact how likely are you to be injured if you are a runner? Well there are a few “incidence” research articles out there but it’s a difficult one to nail down… I mean one runners “minor niggle” is another runners career threatening “injury”. How do you categorise injury? The best study I found was in a Scandinavian Sports Medicine Journal and it focused on regular club level runners, who competed at amateur level. The “injury” categorisation primarily revolved around having a painful restriction that prevented a training run (cat 1 minor injury), and as an extension of this a painful restriction that prevented running for a 7 day period (cat 2 significant injury). Still a bit vague but understandable. It turns out 64% of runners at this level would have a single, or multiple, Cat 1 incidents in any 12 month period, and 24% of this level of runner will sustain a Cat 2 injury in any 12 month period. So there it is… proof (or evidence if you like) that running is bad for you because this suggests a quarter of all competent, competing amateurs will get injured in any year. 25%. 1 in 4. Good news for me! But hold on a minute. That means 75% don’t get injured. Three quarters. Kind of most of them. And wouldn’t most folks back themselves with 75% odds? Guess the statistics are just a talking point as it all boils down to attitudes, beliefs and perceived benefits. Run, or no run… that is the question. I’m going to say run. And your thinking of course he’s going to say that because he is a therapeutic vulture preying upon the misfortunes of others. But running is good. It’s benefits far outweigh any potential negatives… hugely. Running changes you. I don’t mean this as some sort of evangelical preachy life coach hippy foot born again Forest Gump type of way. I mean physically and physiologically. It modifies your body. And if you do it enough these modifications stick. You change. The machine changes. Good changes. 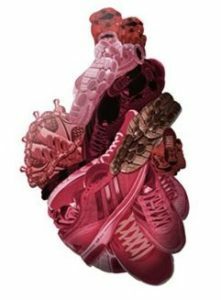 Lets have a look at a few of these in detail and then you can make your own mind up on the benefits of running. You are going to increase your numbers of blood vessels. Your capillary network is going to get more extensive. The tiny vessels that bring oxygen and nutrients to busy muscles, and carry away metabolites and by-products. Repeated demand leads to adaptation and your going to get more of them. Cut up your calf muscles and compared to a non-runner yours are going to be redder! Your heart is going to develop a better vascular network as well… and this is a very good thing. It reduces risks associated with cardio vascular disease. A lot. A bigger pump with a more extensive network of vessels feeding the demands of regularly running muscle groups is clearly going to need something… more blood. Compared to sedentary folks, regular runners have more volume of blood in their developed systems. Elite cyclists have loads more… up to 2.5 litres more than your standard adult volume of 5 litres. Recreational runners won’t quite match that, but there will still be more than your couch athlete. Not only more blood… but better blood. Blood with more haemoglobin… the all important oxygen carrier. You don’t have to train at altitude, or sleep in hypoxic tents to achieve a degree of haemoglobin increase… you just need to train… regularly. Stronger heart, increased network, juicier blood. A more expansive system under less stress, less pressure and with a wider capability. Great stuff. You will get a bigger engine but it will become more fuel efficient. Your running muscles use two types of fuel. Glycogen, which generally comes from carbohydrates and is stored in the muscles themselves, and the liver. And fat, which is generally abundant and liberally spread amongst most of us. Your glycogen is your rocket fuel. Quick burning, fast running, quick to run out with limited supply. Your fat is more slow burn, energy rich but takes longer to mobilise. As a recreational runner you need both. You also need loads of mitochondria… which burn the fuel with the oxygen and produce energy. Regularly trained runners with demanding muscle cells refine their glycogen/fat burning capability and also produce more mitochondria. Big horsepower but more miles to the gallon just by regularly chucking yourself down the road… that is impressive. You gotta love the bodies adaptability. Love your machine. Bones of steel. Well not steel… collagen, laced with calcium phosphate and calcium carbonate. Proteins and minerals honeycombed together to make a strong framework. Bones like a good pounding. 3 times your own bodyweight smashing into the ground every running stride is a decent pounding. Tens of thousands in a weeks standard training. The bone is stressed, it responds by stimulating a repair process… the protein network becomes more dense and attracts more minerals within its honeycomb. It gets stronger. All good. BUT… there is a caveat on this one. It needs to be allowed to respond and repair to the stimulus. It does this as you rest and recover. Recover well and bones love it. Fail to factor in recovery time and the bones repair catch up process falls behind. And for some with potential vulnerability this can lead to bone stress injury… stress fracture. So train hard, but rest well. Muscle magic. Just like your heart structure changes, so will your muscles. Like bone they respond to repeated loading (running) by adaptation. They have to just to keep up with the running demand. Sedentary muscles loose their quality. Regularly ran ones do the opposite. They become denser, their fibres become more closely packed, and the vulnerable cheesy weak fibres become pruned out and replaced by springier more resilient ones. They store more elastic energy and improve their ability to produce force. They may even change shape, or at least regain some shape. Excellent stuff. Brain benefits. Do you subscribe to Cerebral Cortex, the journal for clinical neuro-psychology? Me neither, but in 2008 a much quoted German research paper was published called The Runners High; Opioidergic Mechanisms in the Human Brain. If you want to read it here is a link; Runner High Research , and it contains tremendous phrases like “parahippocampal gyrus”. 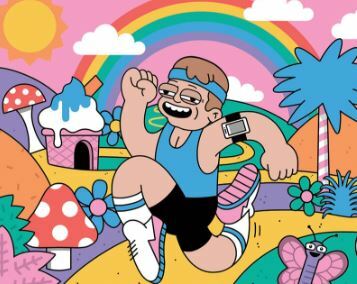 You have one of these in your brain… and it turns out it loves running. It seems that exposure to a degree of CV exercise can stimulate a hormonal cascade and perceptual behavioural response that creates euphoria. And we all deserve a bit of euphoria now and then. I like the brain juice Runners High theory, but I also think that regular running offers something a little more cognitively stimulating. Runners want to go faster and further. They set goals, and if these goals are realistic they have a good chance of achieving them. And that’s the real deal. Achievement feels good… however small and incremental. The training has paid off, the plan has worked, the effort has been rewarded with a smattering of self-esteem. Next, you reset your goals. You become homeostatically efficient under physical duress. And you gotta admit that sounds cool. And it really is. Its healthy as well. You see the human body is always trying to keep itself in a state of physiological and metabolic equilibrium (homeostasis). A constant 98.6 degrees Fahrenheit. Balanced fluid/sweat. Calorie controlled. Blood sugar and hormones level. Oxygenation efficient. Blood volume distribution appropriate. A smooth running machine but able to respond and thrive if exposed to physical distress… up to and including recovery from near exhaustion. To do this it needs to practice… it needs to nudge up against exhaustion now and then, and taste a bit of duress regularly. Sedentary lifestyles simply do not expose the owner of the sedentary body to physical duress. They become rubbish at temperature control, blood sugar mobilisation and rapid response metabolic demand. The machine grinds to a crawl. Regular running is a great way of challenging and retuning your homeostatic ability. Go clean your pipes.